The capital needs of midstream oil and gas infrastructure development are often overshadowed by the staggering scale of the shale oil plays emerging across the United States. Over the next 20 years, Deloitte estimates capital spending of $133 to $210 billion for the infrastructure development needed to keep up with new production from the prolific shale plays. The need for new infrastructure development is increasingly visible. One-third of the natural gas produced in the Bakken is flared. Despite record natural gas production in the northeast, huge spikes in natural gas prices were experienced during the recent unusually cold weather. The macro case presents a simple, positive investment thesis for midstream assets. However, the long-term nature of these investments necessitates a diligence process in both investment strategy and selection. The midstream sector of the oil and gas industry includes a variety of investment options in transportation, storage and processing. The amount of capital needed to satisfy development may appear burdensome. So far, the current low interest rate environment is likely to drive sufficient dollars into these investments in the near term as investors search for yield. The Master Limited Partnership (MLP) has become a popular entity among investors as the MLP is forced to return a large portion of earnings. The Federal Reserve has shown no signs of significantly increasing interest rates, so this source of capital is unlikely to diminish in the near future. Similarly, investment capital is steadily flowing into private equity funds focused on midstream asset acquisition and development. 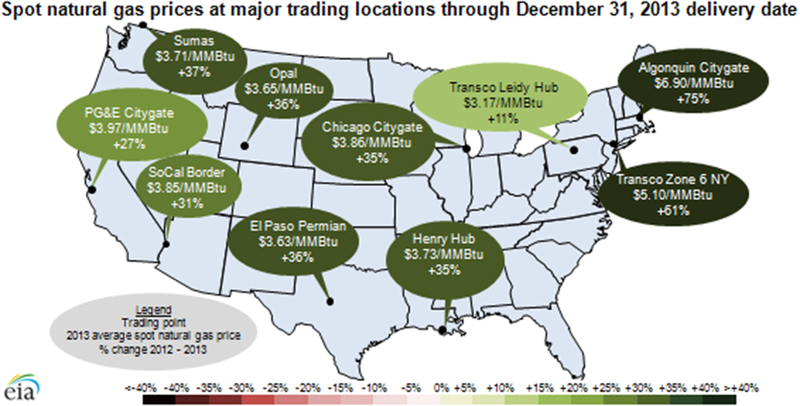 Natural gas markets in the Northeast are experiencing a huge bottleneck. A dearth of pipelines is depriving consumers of the full benefits of low-cost energy. Although the wells in Pennsylvania are practically in the backyard of the Northeast and Mid-Atlantic states, pipeline companies are still working to connect the gas fields to the utility pipes beneath towns and cities. The profiles of the projects proposed in the Northeast and Mid-Atlantic states follow the typical trend in midstream development funding. Public and institutional capital sources tend to fund the major infrastructure pieces – trunk lines and LNG export terminals – while private equity typically participates in projects requiring less than $500 million – regional gathering systems and rail terminals. The Marcellus-Utica Shale is estimated to be the second largest gas field in the world. Thus, natural gas transmission projects are projected to demand the lion’s share of capital investment necessary in the hydrocarbon infrastructure space. The infrastructure traffic jam in the Northeast appears to be a lucrative opportunity, but carries the complex issue of selection. High-capacity interstate pipelines, for example, have the potential to unlock significant value as the Northeast evolves into an export market for natural gas. Yet, projects of this scale require potentially uneconomic levels of capital investment as route selection and right of way issues in a densely populated region add to bottom-line cost. It is imperative that investors pay careful consideration to the demand profile of the target market prior to deploying capital. Tudor, Pickering, Holt & Co. recently performed extensive analysis on the evolution of natural gas markets in the U.S. Their findings unveiled a number of demand undercurrents that are beginning to drive investment decisions. Low-priced natural gas is bringing manufacturing and other energy-intensive industry back to the U.S. Florida and the Gulf Coast regions are emerging as the most likely markets outside of the Northeast for the huge supply of Northeastern natural gas. Population growth in Florida is taxing existing natural gas supply and driving up prices. Similarly, new capacity in the petrochemical and power generation industries in the Gulf Coast region are seen as having the capability to outstrip existing supply. While pipelines are the logical long-term solution to rebalancing natural gas markets in the U.S., many producers may be hesitant to commit production to new, relatively high-cost routes. Therefore, the challenge for private equity investors is identifying natural gas pipelines and gathering systems with optimal cost structures that will attract producer commitments. Such projects pose high risks in the developmental stage, but provide attractive predictable yields and lucrative exit strategies through sale or conversion to an MLP. The vast new natural gas reserves are also driving a need to develop new processing capacity across the country. Natural gas delivered to end-users must meet certain quality and BTU content specifications that are closely monitored by pipeline operators. Processing facilities extract non-methane compounds from the raw wellhead natural gas to meet pipeline specifications. The liquids removed are the heavier, more valuable hydrocarbons such as propane and butanes, which are often found in raw natural gas. These liquids are more valuable than methane, so are removed and sold at higher market prices. Private equity investors have opportunities in this space by making strategic acquisitions of aging facilities for restructuring and by providing growth capital to independent producers with growing natural gas production. The disruptive nature of the new shale plays is also creating opportunities outside of traditional pipeline projects. Railways have emerged as a short-term solution to delivering crude oil and natural gas liquids. Producers are attracted to rail solutions because volume and duration commitments are significantly lower than most required by pipelines. Railways also offer greater market flexibility than pipelines as the vast rail network in North America allows product flows to be optimally directed amidst changing market conditions. Domestic rail operators have experienced rapid traffic growth over the last few years, constrained primarily by the availability of rail cars and the accessibility of terminals to producers. Private equity funds have the opportunity to benefit from rail constraints by providing growth capital to companies developing terminal infrastructure as well as companies manufacturing rail cars. Midstream private equity investors have seen how these types of investments benefit private equity funds with shorter term investment horizons. The midstream sector of the oil and gas industry is clearly in a state of rapid expansion as the major shale plays across the U.S. continue to outperform expectations. Private equity investors have a critical position in the market forces guiding the developmental decisions that will unlock the value of these relatively new discoveries. Midstream private equity investors are continuing to support the many projects that will help unlock the economic value trapped in the vast North American shale resources. Thomas V. Costantino serves as the Chief Investment Officer of Five States Energy Company, LLC and its affiliate, Five States Energy Capital, LLC. Thomas Edwards supports business development and marketing at Five States.